Even inexperienced traders can easily identify trade. Highs and lows may be easier to grasp even for novice traders. But sometimes they can be too complicated and too demanding for the brain to grasp. Take trend lines for example. They can be too subjective because various traders can have different drawings on them. One thing that can make trading a whole lot easier is indicators. A good trend indicator that you can use is the Rainbow Madness Strategy. This can actually give you some attractive charts. HOW TO USE RAINBOW MADNESS STRATEGY? When the conditions are all met, a Call or Put can hence be placed. You have to do the selection of expiry time and time frame. However, you may use higher expiry time that your chart’s times frame. Therefore, if you are trading using a five minute chart you could set the expiry time to fifteen minutes. You can simply download and install Rainbow Madness archive that has three indicators. When you have installed it you have to paste all of these in your desired folder. You also need to apply all three to a certain chart. Upon installation, you will also see Rainbow moving averages. 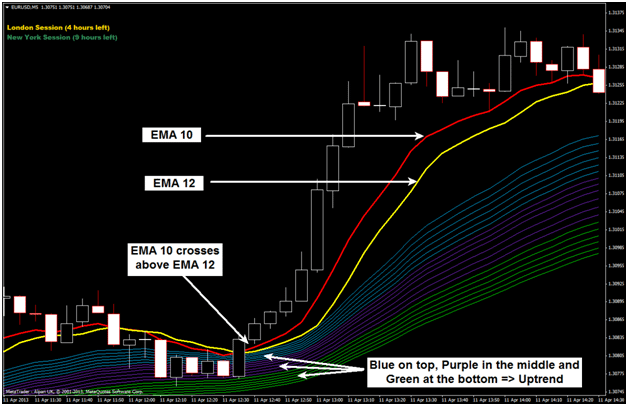 These indicators are for MT4 platform. Thereby, if you do not use this then you can use them manually. Many traders who are using Moving Averages have always complained about its constant lags. As a matter of fact, these complaints are legit because even when you use it they actually lag. The lagging stops once the moving averages are arranged. And when these averages are arranges prices will be gone. The sadder thing here is that you will have no one to complain to when these averages lag. All you can do is wait. However, no system is actually perfect and Rainbow Madness is no exemption of the imperfection rule. The obvious imperfection of this strategy is that it can make you miss trades in markets that are fast moving. It can even give you very late entries. Yes it lags thereby it is sluggish but it can easily compensate with this negative factor. The Rainbow Madness strategy can keep us away from ranging markets. When you realize that the moving averages are all mixed up you will know that it is not the right time to execute your trade. Thereby it is ideal to back away. Trends are not individual moves. This means that the Rainbow can still have time to properly arrange itself. Particularly when you trade different assets, you will then learn how to pick the best signals only.